About Tijen O. Message Tijen O. This tour was the biggest surprise on our trip. We had expected that we would hurry through the ruins of Ephesus, but they proved to be extraordinary. Enormous in size and complex in engineering. The "Terrace Houses" excavation should not be missed. They were fascinating! Tijen was a first-rate guide; knowledgeable and insightful about Turkey in general and Ephesus in particular. She took us to a truly local "buffet" that was an outstanding experience...a delightful meal of authentic Turkish cuisine. We had a wonderful day with Tijen O. as we toured everything there was to see in Ephesus and area. She was very knowledgeable about each of the areas and was very accommodating to answer my many questions throughout the day.Our traditional Turkish lunch was very good. Plan to stay hydrated, shade yourself from the sun with an umbrella if necessary and wear good walking shoes. Although the journey path was well planned you will be doing a great deal of walking. Thank you Tijen for the great day. Spent a lovely day with Tijen at the Virgin Mary's house and Ephesus. She was so warm, knowledgeable and sensitive. Everything was fantastic - comfortable car journey from Bodrum and a delicious local lunch. Highly recommended. Thanks so much! We will definitely be booking Tijen again on our next trip to Turkey. Tijen was an outstanding tour guide! My biggest surprise of the whole trip was Ephesus. It was so beautiful and big. Tijen lead us through the streets of Ephesus and you could just imagine what daily life was like there. Outstanding job! We also visited the house of Mother Mary. Very peaceful and intriguing. We had lunch at a family run restaurant. The food was fantastic. We felt so welcomed everywhere we went. Loved it!! Our tour with Tijen was excellent. She was delightfully friendly and so eager to accommodate us in any way that we wanted to orchestrate the tour. We immediately appreciated her flexibility and the many options she offered. We found her to be very knowledgable and most willing to answer our questions not only about Ephesus, but the state of affairs in Turkey at the present. We experienced Turkish people to be warm, out-going and passionate. We can only hope more people will come to see that by visiting. We very much enjoyed our custom-made tour with Tijen O. Her itenarary for us was very well thought out and included everything we asked for. Her and her driver were on time and both were very personable. Tijen was extremely knowledgeable and we would not hesitate to recommend her to others. Tijen was fabulous! She and her driver totally customized our tour. They got us to Mary's house before anyone else, and I actually got to spend five minutes there with no one else in the house. Normally one is quickly herded through because the queue is so long. She also expertly guided us through Ephesus and the Terrace Houses. She has been a guide for more than 20 years, and really knows the culture and the history. We very highly recommend her! Tijen is very informative and friendly. She gave us an excellent tour of the Virgin Mary's Home, the amazing ruins in Ephesus, and an authentic local Turkish lunch. We would not hesitate to recommend her to our friends. The hotel was very nice, with a lovely room. The manager was extremely attentive, and arranged for excellent dinner and breakfast. He made us feel at home. The balloon ride was spectacular. Everything happened in a timely and organized fashion. The views were amazing. We were met at the airport with no difficulties. The ride to Cappadocia went smoothly. Tijen is a thoughtful, informative guide. We enjoyed the day we spent with her, and the tour was excellent. She took us to a very nice restaurant for lunch. We would highly recommend Tijen as a tour guide. Tijen was great! Her instruction to meet were clear, and she was right there ready to go. We toured Ephesus, the house of Mary and the St John Basilica, all of which Tijen was able to make come alive with lots of details and the historical background. For lunch she suggested a little home kitchen attached to a carpet weaving co-op. This was a brilliant surprise! We got to see master weavers at work, and came away with a whole new appreciation for Turkey's carpets! Would definitely book with Tijen again! Ephesus was hot as hades but Tijen managed to always find some shade for us and keep us away from the mooing herds of umbrella led tours. She told us about the ruins and their inhabitants without being pedantic and always had a ready smile. I wondered why she entered the ruins with a bag of snacks but soon found out that the feral cats knew the reason; she must feed them on every tour. Our family of three spent a lovely three days with Tijen in Ephesus and the Cappaodocia region of Turkey. Tijen is an excellent tour guide, mixing a balance of sightseeing, comprehensive knowledge, good humor, and awareness to the needs of her clients. She was especially attentive to our four year old daughter, who thoroughly enjoyed her. Tijen takes care of all of the details, which is something I can't say is true of every tour guide. Our family would give her six stars out of five if we could! Our daughter and son-in-law had a wonderful time with Tijen on their tour of Ephesus! She was knowledgible, friendly and caring, and they were thrilled with all they learned. This was the third time I booked this tour with Tijen. The first time was so good, we wanted to do it again! We had to cancel our trip last year, so we were very happy to find that Tijen was available this year. I would go with her again in a heartbeat. We took a day trip from Istanbul and our flight was delayed by one hour. Tijen was at the exit when j called her to say we had arrived. We went straight to the house of Mother Mary and thankfully many of the tour groups were done by that time. I later heard from a friend who was also there that day that there was a Mass earlier and we felt bad we missed it. Tijen was great and very informative. We asked her to take us to St. John's Cathedral and she obliged as we had time. Thanks Tijen you were great! Tijen was very friendly and accommodating to our needs. She was very knowledgeable. We really enjoyed the tour with her. Tijen was very flexible and responsive to our requirements for the day. She provided a comprehensive tour of Ephesus and the terraced houses which we had not seen on a previous visit. The authentic Turkish lunch was a highlight - she joined us for lunch which provided us with the opportunity for relaxed conversation. The vehicle was spacious with an excellent driver. A wonderful tour and Fatma who was a standin guide at the last minute was informative, friendly and full of knowledge and we could not have had a better guide. This tour is highly recommended. Tijen is as good as guide as can be found in Ephesus! First off, our cruise had to cancel a stop in Cesame due to wind and decided to go into Kusadasi a day early. Tijen was able to accommodate our tour one day earlier...many thanks! She lead our group of six thru Ephesus at our pace and every highlight was fully described. She was a natural in working with people and she always was eager and ready to answer our questions. All six of us would offer high recommendations for Tijen! A highly enjoyable tour by Tijen, who is both informative and entertaining. Her bubbly personality makes you feel as if you've known her for years. A far better way to see all the sights of Cappadocia than in the big tour buses, we managed to cover all the major attractions, had some very good lunches, and Tijen was able to deal with extra requests, such as the balloon trip and a wine tasting visit. Nothing is too much trouble for her. The 2 days we spent with her really 'made' our trip worthwhile. Tijen was excellent! Very knowledgeable, and helpful, even giving advice for the rest of our Turkey trip. Great sense of humour as well, and such a lovely person. Tijen is very prompt and professionl and even arranged a large van for our tour much to our ( and her surprise). She is curteous, knowlegable and highly efficient, taking us to all the sights and explaining all accordingly and left us to ample time, "space" to explore them. She fulfilled her role as a tour guide perfectly for the day, and respond well to questions and requests. 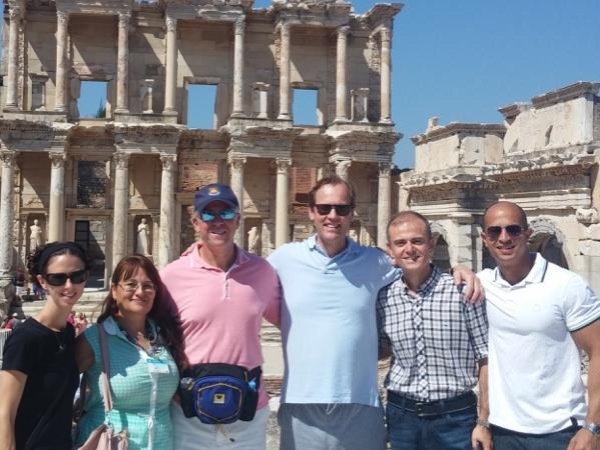 The guide was extremely knowledgeable regarding both the ancient and Biblical history of the Ephesus. She was also flexible to allow us to tailor our itinery somewhat to allow us to experience some aspects of Turkish culture via the cuisine and handcrafts. Tijen is such a nice lady and very knowledgeable about the Ephesus. She knew so much about the history and culture and did a great job of informing us. Her personality was very pleasing and my wife and I enjoyed the tour very much. If we were to return to the Ephesus area we would definitely hie Tijen again. We even found out from her that she does a cooking tour where she assists guests in buying ingredients for and making a traditional turkish meal - very talented lady. Tijen was a wonderful and knowledgeable guide. We spent two days exloring Cappadocia in a big comfortable van with Tijen. She arranged the program to fit our schedule and took us to places at our own comfortable paces. She listened to our requests and very helpful and flexible and Would recommend her. We did two tours and spent four days with Tijen. In my opinion one of the marks of an excellent guide is fixing the clitches. We had a couple and Tujen made things work without us being inconvenienced. Tijen was prompt and took our group of 12 directly to Ephesus with tidbits of information along the way about the area we were passing. In Ephesus she included the children in the tour and made it interesting even for my four year old boy. She was knowledgable and friendly and told us some fascinating history of the area. Also she took us to a tile/pottery demonstration where she had set up lunch while we watched the guy make pottery. It was a perfect end to a lovely tour. Use Tijen as a guide! Tijen was very professional tour guide and friend as well. She was able to understand very quick on who's the guest; behavior, interests, what food they like, what's their budget for shopping, and other things ... basically she's somebody who you want to be with in guiding you to see, enjoy and learn about the beautiful Turkey heritage. If I go to Turkey again, I would like Tijen to be our guide again ... I'm sure you also have to do the same. TOUR GUIDE RESPONSE: Dear Dian Andari , Thank you very much. It was very nice to meet with you . I hope we can meet again in Turkey. Warm Regards . Tijen O..
TOUR GUIDE RESPONSE: Dear Keith, I was so sorry , I wish I could have more time with you and with your nice family. I hope next time Please keep in touch Tijen O.
Tijen was quite ill and so we had a replacement. We had booked for a 5 hour tour and our guide repeatedly kept trying to increase the time even though we repeatedly told him we wanted to end at 5 hours. He was difficult to understand and kept asking us "Why" or "What" something was before telling us. Sometimes he even called out a specific name or two in our group of 4 to answer his question. If we knew all about the sights, we wouldn't have needed a guide. We were all glad when the tour ended. TOUR GUIDE RESPONSE: I am terribly sorry about that. I arrived at the port to meet with the customers and I started feeling quite sick since I started feeling that way right before the tour I felt obliged to arrange the customers a substitute. Once again it was a last minute situation. I am really sorry about that. TOURSBYLOCALS RESPONSE: Her guide manager was made aware of this situation and is working with her on ways of avoiding situations like this of happening again. We tried to get in touch with the customer in order to sort this situation out and had no success hearing back from him as of now. Excellent our for 6 dults. Ephesus, plus some additional elements. Tijen was very informative and was able to explain the history in both detail and context. Very flexible in arranging the itinerary both ahead of the tour and also adjusting to our needs during the two days. We wanted a relaxed pace with culinary elements. I recommend you allow Tijen to select he restaurants, it certainly worked for us. Our family had 2 amazing days with Tijen. Our program was flexible to our requests and there was extra focus on things that interested the children and pleased to navigate around the large group touring schedules- our favorite was the underground city. Tijen went above the call of duty assisting us with travel changes and airport transfers. We are thrilled with the unique artwork we purchased and to have met the Turkish artisans. We highly recommend Tijen especially if traveling with a family. Tijan was knowledgable and covered everything we initially asked her to do. The authentic Turkish lunch at a local village was great and she even introduced us to a family in the village that she was friendly with. It was an excellent experience. Terrific tour. Tijen is a very knowledgeable and friendly guide. Very accommodating. Good English. Would recommend. Tijen was a very good guide. Her English was excellent. I do think it would help, since we were a grp. of 6 to have some type of mike system in car to help understand the guide when the car is moving. She was very knowledgeable about the tour of Ephesus and would highly recommend her. TOURSBYLOCALS RESPONSE: We are glad to hear you enjoyed your tour with Tijen. The microphone suggestion was brought up to her support manager and will be passed on to the guide. Unfortunately, Tijen did not show up for our tour. She did arrange for a substitute guide (don't know his name but he was from Bodrum), so we went on the tour anyway. Overall, the tour was fine. The guide was knowledgeable and we enjoyed seeing everything in Bodrum Castle. However, on the way back he asked if we would like to go have coffee and see how Turkish rugs are made. We did not expect to be taken to a carpet showroom! We felt guilty not buying a rug, but weren't interested in that at all. TOUR GUIDE RESPONSE: Dear Laurie, I am very sorry about that but it was just last minute my douhgter sicknes. And do not have time to inform you and toursbylocals. Please forgive me.I told the tour guide many times do not go any shopping. Thank you for your understanding. Tijen O.
TOURSBYLOCALS RESPONSE: We reinforced with Tijen our substitution policy with Tijen and also talked about her replacement. She informed us, she asked him several times to not take the visitors to the shops in case they did not want to but for some reason that happened. We've attempted to contact the traveler for further details, but without success. Tijen was a knowledgable guide and pleasant company on our visit to Ephesus. After the tour we mentioned that we were having trouble finding out information about the ferry service to Samos and Patmos (the web information about Greek ferries is hopeless). Tijen made a few calls and had the whole thing arranged. We left the hire car outside her friends office, he took us to the ferry terminal, and the tickets were waiting for us. No extra charge. I would highly recommend Tijen. Tijen was a great guide and we enjoyed our time with her! She was very informative and made the tour very comfortable. The only downside was that she was about 15 minutes late meeting us at the dock. I would definitely recommend her as a tour guide. Thanks Tijen! TOURSBYLOCALS RESPONSE: We are glad to hear that you enjoyed your time with Tijen. Her tardiness is extremely unusual and the issue was brought up to her and her manager. According to Tijen, the meeting location was not very precise and customers and guide took a little longer than usual to meet up and start the tour. Tijen was a wonderful guide, a nice person and fun. She navigated us through the VERY crowded ruins educating us about all that we were seeing. We thoroughly enjoyed it and highly recommend her. Tijen was very knowledgable about Ephesus. Our only dissapointment was not visiting the Terrace Houses. It was a very hot day (95 degrees F) and Tijen said it would be even hotter inside the Terrace Houses so we opted out. On return to the ship however other passengers had gone into the Terrace Houses and said it was actually cooler inside than outside and that it was amazing inside. So we wish we would have seen them. TOUR GUIDE RESPONSE: Dear Karen, I am happy to hear you enjoy your tour. But sorry to hear that someone told you terrace houses are not hot or cooler.Still I can tell the same thing , because of being coverd place you could feel more warmer.I will ceck tomorrow real tempreture inside and outside of the terrace houses. Thank you Tijen O. We liked Tijen and thought she was a knowledgeable and experienced guide. We had a very nice day covering some areas around Ephesus since we had been to Ephesus before. We visited a former Greek Village, the archeological Museum at Ephesus, toured Priene, had the best meal of our trip and bought beautiful jackets in a leather store. Tijen was outstanding. Met us on the pier upon arrival. Discussed the itinerary and agreed on an excellent tour plan. She is clearly enthusiastic about Turkey and the sights. Very knowledgable about the history and culture. Visited Ephesus including the terrace houses, Virgin Mary's House, Temple of Artemis, and concluded with a lovely lunch with outstanding food selections by Tijen, followed by a rug making exhibition. Truly outstanding tour. Will ask for Tijen by name on a return trip. The guide noted on this rating was not the guide who did our tour. We would have liked the guide to consider our special request (limited walking) more carefully and adjusted the itinerary accordingly. TOUR GUIDE RESPONSE: Dear Bruce , According to my last minute sickness I had to arrange one of my friend at the night. Sorry for this contition. Thnk you for your understanding. Tijen O.
TOURSBYLOCALS RESPONSE: We've spoken to Tijen about this situation - she was ill from food poisoning the night before and had to find a replacement very early in the morning. We've asked Tijen to ensure that if using a replacement is necessary that they be fully versed on the special requests of the traveller. The Ephesus site can be challenging for people with walking difficulties. Tijen was prompt in meeting us and then asked we it was okay if her 8 year old daughter spent the day with us. We felt we had no choice but to say yes. Although her daughter was polite, we felt at times when the local area or Turkish history could have been explained, Tijen talked with her daughter ignoring us. The scope of the tour in Ephaseus was a brief description and left us alone until the next thing she wanted to showed us. Disappointed and won't recommend her. TOUR GUIDE RESPONSE: Sorry to hear that you were disappointed in my tour. I felt that even though my daughter was along, I didn't ignore you. I try to be selective in how much information to give and let you enjoy the sites without constant commentary. TOURSBYLOCALS RESPONSE: We've spoken to Tijen about not bringing family members along in the future as well as being more sensitive to those travellers who are looking for a more in depth commentary. Tijen was WONDERFUL! she knows her history and is very proud of her country. We wanted to eat in a local restaurant and she took us to a small place where the women were making the pastry sandwiches the way the have made them for eons. The food and the people were wonderful and we were able to experience local flavor. Ephesus takes your breath away. The history and what is being uncovered is mind boggling. We feel that we have a wonderful new friend in a far away land. Both typical visitor sites and off the beaten path experiences were provided with interesting information, and dedication to insuring we have the kind of experience we wanted. Tijen is a sweet and knowledgeable lady. We enjoyed spending the afternoon with her taking in the amazing sights. She did mislead us, however, saying she was taking us to a leather factory to see how leather products are made (which is something Turkey is known for) but instead brought us to a high pressure sales pitch to buy leather jackets at upwards of $1000 US. TOURSBYLOCALS RESPONSE: Thanks for your feedback. We have spoke with Tijen about the need to disclose the possibility of high pressure sales techniques such as this prior to the visit. She was pleasant and reliable, provided enough information of the area that kept us intrigued, asked as if we wished to see the bazaar or a factory which originally stipulated we didn't want to do but was glad she did as we found a lovely mall rug we will hang. She has a quiet demeanor which could be taken as lack of interest but was acceptable to us. My sister and I had a great time w/ Tijen visiting Sirence and Kirazli. After spending 14 days actively touring the country w/ a large group, it was nice to have a casual day in the countryside. We really liked Kirazli, where Tijen ordered a delicious Turkish lunch for us at a family restaurant. Tijen speaks English well, and she was very informative about the history of the area. Everything happened right on time, and she also arranged for us to be dropped at the Izmir airport for our flight home. Tijen was fantastic. She was thorough, articulate and warm. Always sensitive to our needs and interests. We highly recommend her. This tour was amazing and our guide was what gives this tour a 5 star. From the moment she picked us up (she had a private driver) we were getting information about the population, climate, etc. She Tijen had a map with her and talked about all areas of Turkey as we made our way to Mary's House and then to Ephesus. Our vacation was 3 weeks in Europe and all 4 of us will never forget how Tijen walked us through Ephesus. It was as if she was born and raised in the city as it was being built. We loved this! I would highly recommend Tijen as a guide for Kusadasi and Ephesus as she has a wealth of knowledge about the area and is most accommodating. We could have spent less time visiting those factories, 4 in all, trying to sell something to us. Though relatively satisfied with the places we visited I just felt we were being hurried because of the time spent on those factories. I guess when we say we are not interested it should be respected. TOURSBYLOCALS RESPONSE: We're glad you enjoyed the tour. We've reminded Tijen that it is ToursByLocals policy that travelers are only taken to shops if they specifically ask and if the experience is fully explained in advance - ie 'you'll experience high pressure sales techniques, etc'. We thoroughly enjoyed our tour as it met all expectations. Tijen was Knowledgeable, personable, and accommodating. I highly recommend her. Tijan is a charming young woman, who has an extensive knowledge of her country, and pride in her profession of tour guide. We felt very confortable with her from the moment we met her. In Ephesus she gave us an excellent understanding of it's place in history, and what life must have been like in those times. After Ephesus we proceeded to a local village where we had a wonderful local lunch, which included a short cooking lesson. When in Kusadasi ,don't hesitate to book Tijan. Tijen is a breath of fresh air with sparkling personality and depth of knowledge. My family really warmed to her, she is about the same age as our kids. Everything with a smile and a laugh. Ephesus ancient history come alive. Do not miss the excavation of the terrace houses, that overlooked the harbor. It costs a bit more but worth it. Tijen allowed time for shopping on return trip, a hit with wife and daughter. Later that evening we ran into Tijen and friends shopping and we were old friends. Tijen provided our group of four adults with an absolutely wonderful tour of Ephesus. She was warm and cordial, but also serious and professional. It is apparent that Tijen not only is well-trained but she has passion for her job. Her English is very good. I recommend her without reservation. Thank you Tijen for making our day at Ephesus a grand success. When Tijen met us at the ship, we knew we had a winner. On the way to the site, she gave us its history over the centuries. Her deep knowledge of Ephesus transformed our day. She spoke excellent English, and answered every question. As we progressed through the site, she kept an eye on me (80); if needed because of the rough terrain, she offered me a strong arm. The lunch we ate was delicious. At our request, she took us to an excellent carpet factory. Our whole day was a huge success. Jim in Ontario. Tijen and her driver provide four of us with a wonderful, pleasant tour of all relevant areas. We highly recommend their services to other visitors. John in the US. Dear Tijen, Our family cannot thank you enough for the wonderful tour you gave us of Ehpesus, the home of Mother Mary and the area around St. John's. You are so knowledgeable and pleasant that you have given us all the most pleasant memories of Turkey. With warm regards,The Gerardi Family. Tijen was timely, proficient in English, flexible, and anxious to share the village experience. Lunch at a local restaurant was one of our favorite meals and Tijen was quick to explain everything to us. As an educator I was anxious to see a local school, and Tijen added that to our itinerary. As travelers, not tourists, we highly recommend Tijen as a local guide! Tijen was not available due to an illness. Her replacement however was excellent. He was very patient and knowledgeable. We went to all the sites we wanted to see. Small glitch at Virgin Mary's house regarding amount due - I think he charged us for parking because what he requested did not jive with previously quoted amount. Tijen supplied a great tour of Ephesus for our family of 3 and another family of 4. She was able to be as detailed as we would allow as well as letting us explore a little on our own as we sometimes wanted. She spoke with us regarding current lifestyle and culture and community as well as the history. We enjoyed one of our favorite lunches on the entire trip at a local cafe/deli type spot in town. We were able to enjoy many plates and tastes of the local cuisine. We found the tour and Tijen very nice. Tijen was not available so her husband took us and was competent and knowledgeable but was not very engaging. when we wanted to see the museum at Ephesus, he merely dropped us off to tour the museum instead of taking us through and guiding us. We still saw what we wanted but was not nearly the experience we had with other guides. TOURSBYLOCALS RESPONSE: Before the day of the tour Tijen had obtained the customer's consent to have her husband give the tour.